This is a fun, warm treat that yield 2 – 3 servings. I love when there is a little leftover to add to my oatmeal the next morning! Directions: Preheat oven at 350. Mix apples with coconut until well coated. Pour mixture into small oven-safe dish. Combine almond flour, nut butter, honey, vanilla, cinnamon & sea salt into small bowl until a crumble forms. 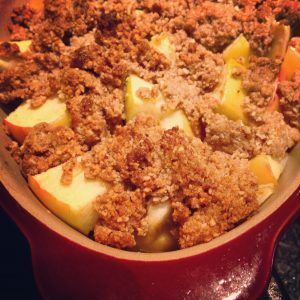 Crumble evenly over dish of apples. If using chocolate, break a square or two of it into as many pieces as possible and sprinkle over mixture. Bake in oven for 15 minutes or so until the crumble becomes brown. Let cool for a bit then enjoy!